I read a lot of crime fiction, from the golden age of the British detective of the 1930s to hard boiled Californian noir, I could spend all day reading gruesome tales with moral endings (well, mainly with moral endings, I am also partial to Jim Thompson). One thing that has caught my eye is the number of detectives who have secretaries. Almost every detective worth his or her salt needs an assistant to keep order whilst they are gallivanting across the country after master criminals or just downright bad people. So here are my favourites from detective fiction. Who doesn’t like the efficient, reliable Miss Felicity Lemon? 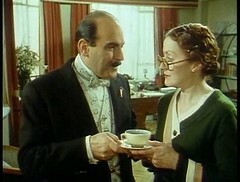 Maintaining the scrupulously ordered office of Hercule Poirot, with her keen eye for detail, anything she says Poirot takes notice of and she rarely makes mistakes. Pauline Moran’s portrayal of Miss Lemon in the Carnival Films productions of ‘Agatha Christie’s Poirot’ is one of perfect 1930s working style, with a preference for some rather extravagant hats. No wonder she is a style icon for many girls with an eye for practical art deco fashion. To me Velda is the epitome of the pulp fiction woman. As Mike Hammer’s faithful secretary and business partner she is clever, beautiful, confident and willing to put herself in all sorts of unpleasant situations for Mr Hammer. More femme fatale than factotum as this description shows. As Perry Mason’s confidential secretary Della Street is loyal, discreet and a marvellous gatekeeper. She not only runs his office but can be relied on to undertake detective work when necessary. Perry Mason would be lost without her. Although the recipient of repeated marriage proposals from Perry, Della knows that to be his wife means forfeiting her role as his secretary, and she knows which role will bring her the most excitement. Well those are my top three, all different women with only a job in common. Have I missed anyone out? Who are your favourite criminal secretaries? And as always, book recommendations greatly appreciated!